Andreas V. Georgiou is an economist with specializations in Monetary Theory and Stabilization Policy and in International Trade and Finance. After working for the International Monetary Fund, he returned to Greece in 2010 to head the newly established Hellenic Statistical Authority (ELSTAT)-the successor of the National Statistical Service of Greece following the onset of the economic crisis in Greece. Glenn Platt ​(@glennplatt) is the C. Michael Armstrong Professor of Network Technology & Management & Director of Interactive Media Studies at Miami University​​. He is interested in social media marketing, digital media and e-Commerce​​. He is also the faculty ​sponsor of the Esports team at Miami. Dr. Brian Moyer is director of the U.S. Bureau of Economic Analysis . BEA, made up entirely of career civil servants, is an impartial producer of official statistics on the U.S. economy. Its statistics are used by businesses, policymakers and households to inform their decision-making. BEA is part of the U.S. Commerce Department . Rosemary Pennington: In news stories about the health of the American economy or sometimes on Sunday morning talk shows, you might hear experts talking about the GDP or Gross Domestic Product. The GDP is a measure of the value of all goods and services produced during a particular time period and as you might imagine it's quite the undertaking to keep track of all that information. The organization that does that among other things is the Bureau of Economic Analysis and it's the focus of this episode of Stats and Stories, where we explore the statistics behind the stories and the stories behind the statistics. I'm Rosemary Pennington. Stats and Stories is the production of Miami University's Departments of Statistics and Media, Journalism and Film and the American Statistical Association. In the studio...our regular panelists, Statistics Department Chair John Bailer, and Media, Journalism and Film Department Chair, Richard Campbell. Our special guest today is Brian Moyer who's the director of the US Bureau of Economic Analysis or BEA. Thank you so much for being here today Brian. Brian Moyer: Thank you very much. Pennington: Just to get the conversation started, give us a real quick overview of what it is your agency does? Moyer: Sure, so BEA is a federal agency made up entirely of career civil servants whose work is to produce official statistics on the US economy. So we have about 500 economists, statisticians, and accountants on staff at BEA. If you look at our formal strategic plan, our mission is to promote a better understanding of the US economy by providing the most timely, relevant and accurate economic data in an objective and cost-effective manner. Most of the folks that think about BEA associate with our flagship product as you mentioned a moment ago, Gross Domestic Product or GDP but you know we're a lot more than just GDP. So if you want to know how the broad economy is performing, we can tell you that. But if you want to know how a particular state or a metro area is doing, we can also tell you that. There is also lot of information we provide at the sector level so if you want to know how manufacturing or finance or retail trade is performing, we can tell you that too. Finally, I mentioned that we have a whole suite of international statistics. So if you want to know how the US is faring on the global stage we have lots of information to answer all those questions as well. And these are just a few examples of the hundreds of millions of data points BEA produces each year. John Bailer: That leads to a really natural follow-up question. What exactly is the Gross Domestic Product? Moyer: Well I guess the question here is how wonkish do you want me to be in answering this question? Bailer: Well you know... so people talk about things like you hear about the Gross National Product, then you hear about Gross Domestic Product and you hear about other kinds of indicators. So could you give us the high-level view of what is such an index and why is it an important index for us to consider as a nation? Moyer: Yeah absolutely. So the official formula for GDP is consumer spending plus business investment plus government spending plus net exports, which is the difference between exports and imports. But another way of thinking about this or another way of putting this is that GDP is the broadest measure of economic activity for the US economy. It's the total value of goods and services from machinery to manicures produced within the United States during a given period. Now GDP reflects the value of production solely within the US borders. GNP or Gross National Product as you mentioned a moment ago, reflects the value of production by US residents within US borders and the production from operations abroad. Now you know, we actually produce both GDP and GNP here at BEA. GDP is BEA's primary or so-called featured measure of economic output. But prior to 1991, GNP was the primary measure. So you know you might ask why the change in emphasis? Why did we switch featured measures? The rationale was that GDP was the more appropriate measure for better grasping what was happening specifically inside the United States. GDP is also the worldwide standard so we can make inter-country comparisons by using the measure of GDP. Richard Campbell: I read over the recent press release on the economic impacts of art and culture in the US and first of all I want to compliment whoever wrote the lede to this press release, I'll just read it real quickly here. Sure, Broadway and Hollywood employ lots of creative people but when it comes to artistic and cultural work not all the action is on the coast. New data show Arts and Culture accounts for a larger share of jobs in Wyoming, Utah and Colorado than they do nationally. Moyer: Yeah, this is actually a brand new product that we're beginning to publish now on a regular basis. It's interesting because it's a partnership with the National Endowment of the Arts and this account measures not only sort of national level impact of Arts and Culture activity on GDP but as you just mentioned a moment ago, it breaks that activity out by states so we can say something state by state. Now, as we're getting started here we're just looking at compensation and employment but as we move on we're going to be able to break out those value-added measures state-by-state as well. And let me add one more thing before we move on. This is a nice example of what BEA calls a satellite account. So the arts and cultural production account is one of those accounts that is not included in the core set of counts per other accounts produced by BEA but rather it sits on the side and is consistent with the core set of accounts. But it's an area where... it's an account where we're able to pull out information from our national accounts or industry accounts, our regional accounts and our international accounts and tell a cohesive picture or story about a particular sector of the economy and that's what this is all about. We have a lot of these satellite accounts but we find this is a particularly useful way of addressing user's specific questions about economic performance. Campbell: Just to follow up on the surprising thing here and I think you have this in the lede is that you have something called the location quotient which I want you to talk about. But explain to me, you would expect New York and California to have lots of arts and culture type jobs, but you found that Wyoming, Utah, those do very well too. Can you explain the location quotient a little bit? Moyer: I'll first by saying I'm not the experts on this set of accounts here but the location quotient basically tells you how much of that activity is centered on that particular state in this case relative to the nation as a whole. And so while you would think that states like California, New York, and others would be those sorts of hubs of this kind of activity, there are lots of national parks and government operations and so forth spread around the country whose mission is related to arts and culture. And that's what you're seeing when you see those higher location quotients for areas which sort of you know you scratch your head a little bit about why are these arts and culture related. Pennington: You're listening to the Stats and Stories where we explore the statistics behind the stories and the stories behind a statistics. I'm Rosemary Pennington with Miami University Statistics Department Chair, John Bailer and Media, Journalism and Film Department Chair, Richard Campbell. Our guest today is Director of the US Bureau of Economic Analysis, Brian Moyer. This discussion of satellite accounts, Brian, seems like a story that's probably underreported as far as things coming out of your agency, are there other kinds of stories that you think are underreported that your agency is working on? Moyer: Yeah we have a lot of new products. Let me just say that I think one of the biggest challenges BEA faces of course is keeping our statistics up with the ever changing economy. So we need to make sure our data is meaningful for the world and meaningful for our customers and of course to do that we have to constantly evolve our statistics. So let me give you a couple examples of some new things that we're doing. So we've developed new health care statistics that break out spending by type of disease such as heart disease or diabetes rather than breaking out spending by place of service. So by place of service, I mean hospitals or doctor's offices. So you know why is this important? It's important because it gives us a more complete and accurate picture of health care spending and allows us to capture the substitution of treatments over time. Now that sounds technical but I'll give you a quick example why these accounts are so important? Let's suppose you're suffering from depression. Thirty years ago if you were suffering from depression you would have to undergo a regimen of talk therapy, very expensive talk therapy. Today, you are going to take some kind of narcotics, some kind of drugs to abate that situation. They're relatively inexpensive compared to the talk therapy. If we're to accurately measure health care spending costs over time, we want to be able to capture that substitution from one type of treatment to the other. In this new set of accounts allows us to do that because we're looking at this disease by disease. I'll give you another quick example of an area that we've been doing some work on and that is beginning to produce consumer spending measures broken out by state. So as you know we've long produce consumer spending measures for the nation as a whole as part of GDP, clearly. But this is our first look at consumer spending broken out on a state-by-state basis. So these new data show not only sort of the top-line numbers of consumer spending by state but it also digs in and shows exactly what consumers are buying in each state and these are just a couple examples but there's lots of products like this that BEA has to continually developing, continually innovate and continually expand because after all we have to keep our statistics current with the ever changing economy. Bailer: You know, so if you're breaking down health care expenses by type of disease, I recall that you can see pretty dramatic differences in treatment across the country, even within a state you can find pretty dramatic differences. With some of the data that you're collecting on these types of health care expenditures by disease, also provides some insight to that differential? Moyer: They may in the future. So right now we're focused on the national level statistics but longer run plans are to break these out by state. This kind of leads into a slight digression here but I think it's a useful one. The way we've developed this health care spending satellite account is really an excellent example of how a statistical agency can blend the world of big data and traditional survey data. So we're actually looking at billions and billions of insurance claims data to build this disease based on health care spending account. So given that as the basis for this set of accounts, one could conceivably think about breaking the state dimension, the regional dimension would be embodied in those data and one to think about breaking that out at some future point. I'll tell you, the challenge this set of accounts is facing right now is one that we face in some other areas in the accounts like the high tech sector is adjusting for quality. So when you think about these different treatments over time, you have to be able to account for what that means in terms of quality adjustment, in terms of better quality of life and so forth. So that's really the focus of this research now. But as you suggest in the longer run having a regional, a state-level dimension to this would be an important expansion. Campbell: A lot of the data that you report, the studies you report, get interpreted and reported through news media, could you talk a little bit about what frustrates you about journalistic coverage, what they do well, what they don't do well? Moyer: Generally our output, our products, our statistics are covered well. But from time to time, there are some challenges we face and let me just use GDP as an example. As you're well aware we produce three estimates of GDP in a given quarter. First estimate comes out about 30 days after the quarter end, for instance BEA is going to release its first estimate of GDP for the first quarter of 2017, next Friday, April 28th but then we'll update that figure a month later. In this case on May 26th as new and more complete source data become available and then we'll update that number again on June 29th as even more complete and new source data become available. Because we want to always provide the most timely estimates for our customers. We don't want to wait until all these data are complete before we release a measure of GDP, right? Actually if we waited until all the data were complete and everything was finalized we wouldn't have a GDP, quarterly GDP estimate for about five years so that wouldn't serve anyone. But those quarterly updates or revisions as they're known in the economic circles, are really just that...they're updates. But sometimes, they are incorrectly reported as errors and I'm sure you've seen such headlines from time to time. These quarterly updates reflect our best calculations based on the available source data that we have at that time and we're very clear with our customers exactly what data we have and what we're missing and we make all those assumptions available to our users but nevertheless, nevertheless there are some times when we just get misinterpreted as errors and I can tell you it's quite frustrating. Bailer: I'm curious if part of that is that there's just not an appreciation of some of the uncertainty that goes into a calculation that's this complex. Moyer: Yeah, I think it's the uncertainty factor. I think it's also just frankly us not doing as good a job we can about explaining the process. The process is a technical process. It's a relatively complicated process, you know thousands and thousands and thousands of data components go into GDP and we don't always perhaps do the best in relating that to the average person. Bailer: If someone were just meeting you and finding out you're at BEA, what would they be most surprised to learn that BEA does or that BEA produces? Moyer: The thing they'd be most surprised about is the fact that BEA is not primarily a data collector. That we don't go out and collect all the components that go into GDP, pull the estimates together and publish that number. That's what everybody thinks but rather in this decentralized statistical system that we have here in the United States, that isn't the way it works. In fact what we do is we pull together thousands and thousands and thousands of data points every single month to compile that GDP number. What we do is to basically curate these economic frameworks, these economic accounting frameworks to which all those dataflow in and once they're there, we then harmonize and reconcile within those frameworks. So for example, for the GDP numbers we pull all the data into something we call the national income and product accounts. That's an accounting framework that is populated, harmonized and at the other end out comes GDP. Of course what this means for BEA is that we are often the first ones to see any inconsistencies in the data. We like to say that we're often viewed as a mineshaft canary of the Federal Statistical System, right? We smell it first and there are often cases where... I mean let me just give you a very quick example. A few years ago, we were estimating output per worker for the computer industry. So into these frameworks we pulled the output measures that are produced by the Census Bureau and we pulled in the employment numbers produced by the Bureau of Labor Statistics. Everything seemed good until we started computing these ratios and they looked absolutely crazy. So we say "Wait, wait, wait we got to stop, take a look at this." So we dug into the details come to find out that the establishment list, that the Census Bureau was using to sample its output measures was different from the establishment list that the Bureau of Labor Statistics was using to sample or to compile its employment numbers. Put these two things together and tell oh what wonder we have such very strange-looking output per worker numbers. And so we were able to go back to the agencies and say "Hey you know we need to address this issue." Anyway, so I've strayed a bit from the initial question but I think that the basic thing that I find, that most users are confused about is sort of the fact that BEA is not out there collecting millions and millions of data points through surveys. Pennington: This is Stats and Stories; our guest today is Brian Moyer, Director of the US Bureau of Economic Analysis. Brian, I'm going to ask you a question that's not about the data that you're collecting or analyzing there but really you're sort of about yourself. How did you come to become the director of BEA? How did you get into this line of work? Moyer: Actually I'll be honest, BEA is my first federal job, my only federal job. I'm here right out of grad school. I moved from an entry-level economist in the GDP by industry branch straight up through the Director of BEA. So I'm certainly a BEA person through and through. BEA is a great organization and I guess if I had to say what I like the best about it, is the people. You know, working with BEA's dedicated public servants who care so deeply and are truly committed to the mission of the agency, this is one of the things I just find so satisfying about this job, something that I'm proud of. You know, in measuring this $18,000,000,000,000 US economy is certainly a challenge but it's also really rewarding. One of the hallmarks of BEA statistics is behind every one of those detail numbers that you might pull off our website. There is a person that's doing their very best to accurately measure that component of economic activity and not only that but they're willing to talk to you about that particular component. The dedication of our staff is just one of the reasons it makes me so happy that I've been here for 24 years and I wouldn't trade this job for anything. Campbell: We're in a kind of a political climate right now where there's a lot of assaults on evidence and science and data, what can we do to do a better job of promoting evidence-based research, promoting data, promoting evidence, you have any thoughts about that and are these conversations that you have? Moyer: Yeah, there are conversations that we have and you know I think that at BEA we like to think that what we do is so important and so relevant and of such value that when decisions are made around budgets and so forth that yeah sure maybe we will have to re-prioritize programs here and there but we're hopeful that the overall logic of the policymakers is that the core mission of BEA will be preserved and I think we as an agency sort of hold to that and it's proved over time that does hold. I'll tell you, when I talk to staff about sort of the new world of economic statistics or the new world of big data, this is the thing that really gets them excited. This idea of being able to bring these unstructured data, if you will, administrative data, big data sources, and private data sources into the accounts. This is something that really motivates, really motivates staff and I think that it's a bit of a paradigm shift for the statistical agencies because this type of skill sets, more of those data science type skill sets are not what we've traditionally looked to in the economics profession or in the statistical profession and our world is changing. As I said a minute ago when I start talking about health care satellite account, I mean I think there's a place for both this new big data approach and also the structured survey data. But it's just that, it's a blended approach. It's combining these two worlds and as I say I really do find great excitement especially among the more junior staff coming to BEA around the opportunity that the entire effort reports. Bailer: So to me it's amazing to think about 18 trillion dollars as a number and so I've got sort of two questions, how do you communicate the idea of 18 trillion dollars to people when you're saying you know millions, billions, trillions that I think is really hard to think about magnitude comparisons of this size? So that's kind of my first question and my second question is how does the US economy at 18 trillion, if you look internationally, what's the next economy in the magnitude of their GDP? Moyer: Let's start with the 18 trillion dollar question. You know most analysts looking at GDP, they're interested in the overall level but I'll tell you, the featured thing is really the growth rate. It's obviously important to know about the components and the shares of those components in GDP but I'll say most of the focus from users is on the GDP did increase, did decrease, did it grow 2.1%, did it grow .5%, I mean these are the typical questions that we get. I mean, I think we do a very nice job in the various dissemination platforms that we have clearly articulating how that 18 trillion dollars is broken out not only by sort of esoteric components of consumer spending and government spending and business investment. But I think it becomes a little more real to people and they sort of get it a little bit more when we then break that out by industry and by state and so I think when you start looking at GDP decompose another way it gives some meaning, it gives some context around that like a stream astronomically large top number. Bailer: What's the largest share of that 18 trillion? Moyer: Consumer spending is about 70% of that 18 trillion. Now consumer... now going back to the growth story I was telling you a minute ago, when you look at the NIPA, the National Income and Product Accounts Tables, you'll see that consumer spending is not always the largest contributor. I mean it is big but it's a fairly stable growing component of GDP where compared to something like inventory change that bounces all over the place. So I guess my point here is just to get a large component doesn't necessarily mean that it's going to be any more important than something like inventory changed that make a very large jump in any particular quarter. Pennington: You've mentioned that you're using sort of new kind of ways of measuring economic activity and I'm wondering given sort of the digital environment we live in and for instance social media, is your agency looking for ways of sort of leveraging social media spaces to better communicate this information to the public directly? Moyer: Yeah, we certainly are. We are on the social media bandwagon and I will... so if you think about our...I'll just sort of broadly speak about our dissemination. So everything that we produce is on our website www.bea.gov and we considered some of these similar data for the most important thing that we do in sort of aside from getting the GDP numbers right. One of the things that we've learned is that you really have to keep sort of up to date with the latest dissemination tools and platforms and we now have a complete set of API's that cross all four of our program areas and we've discovered that there's a great demand for that and we're seeing great use and that we're very pleased with that. But the other thing that we just introduced and this is only been a few months ago is something we're calling B-E-A-R, bear, but the R part of that stands for R the programming language. So for the first time we've got this very slick sort of hip way of accessing BEA's data for... obviously this is for our more tech savvy users but it really does allow a user to go in and pull something from across all of our program areas, put it together in a snap and just see exactly what it is... answer the question they were trying to answer. So I just give you a fast example. So suppose someone's looking to gauge the impact of energy goods and services on the US economy. Well certainly that's in consumer spending in GDP, right? Or it's also contained in the international accounts. It's in the regional accounts. It's across all of our accounts. With this API, this R base platform that pulls from our API's will do is just go out there grab all that relevant information, mash it all up and return to you sort of an overall picture of how energy related goods and services impact the economy from a variety of perspectives. So we discover the folk people really like this but first what's happening is now those folks that are really engaged in this kind of work are calling up and wanting more and more and more so we're going to have to prioritize some of it going forward. Pennington: Well thank you so much for being here. That's all the time we have for this episode of Stats and Stories. Brian Moyer, Director of the US Bureau of Economic Analysis. Again, thank you so much for spending part of your day with us. Stats and Stories is a partnership between Miami University's Departments of Statistics and Media, Journalism and Film and the American Statistical Association. You can follow us on Twitter or iTunes. If you'd like to share your thoughts on the program, send your e-mail to statsandstories@miamioh.edu and be sure to listen to future editions of Stats and Stories where we discuss statistics behind the stories and the stories behind statistics. Rosemary Pennington : On May 9th John Thompson-Director of the United States Census Bureau - announced he's stepping down from his job, effective June 30th. The announcement came after Thompson testified to Congress that the cost of the 2020 Census would reach about 12.5 billion dollars. Thompson was expected to remain with the Census through at least the end of this year. The episode of Stats and Stories you're about to hear features Thompson talking about the work of the Census Bureau as well as its preparations for the 2020 count. It was recorded about a month before Thompson announced his resignation from the agency. Pennington : Every ten years the federal government starts counting households, individuals in order to find out just how many people live in the United States. The next U.S. Census will take place in twenty twenty and the U.S. Census Bureau has spent the last several years preparing for the count. The U.S. Census, what it does, how it works, is the focus of this episode of Stats and stories, where we explore the statistics behind the stories and the stories behind the statistics. I'm Rosemary Pennington. Stats and Stories is the production of Miami University's department of statistics and media journalism and film as well as the American Statistical Association. Joining me in the studio are regular panelist John Bailer, Chair of Miami Statistics Department and Richard Campbell, Chair of Media, Journalism and Film. Our special guest today is Census Bureau Director John Thompson who's been in that position since 2013. Thank you so much for being here, John. John Thompson : Delighted to be here. Pennington : Could you describe the path that led you to the U.S. Census? Thompson : Certainly. I went to school at Virginia Tech and I graduated with a Master's in mathematics, with a strong emphasis on statistics and I went to the Census Bureau as a mathematical statistician. I worked there for 27 years in various positions, mostly in statistics. My last job there after twenty seven years was the career person, in charge of the 2000 census. Then I retired from the Census Bureau and went to the private sector, and was fortunate enough to work at NORC at the University of Chicago, which is a smaller nonprofit social science research company, and I was fortunate enough there to become president. And then in 2013, I decided that it was time to do public service, and so I came back to the Census Bureau to help them with their programs, including the 2020 census. John Bailer : What's the difference between a census and a survey? Thompson : There's a couple things. Most surveys are based on some kind of sample, mostly a probabilistic sample and they don't interview every household in the universe. They interview a sample. But the census is actually a complete enumeration of the entire population. So, in each census that we've done, we have tried our best to count everyone in the United States once, only once and in the right place. Richard Campbell : What kind of problems do you have? I mean, in a census, where you actually can't do a sample, you have to talk to everybody. So what are some of the obstacles in getting everybody to contribute to the work of the census? Thompson : Well, you could put the obstacles in sort of two buckets. One bucket would be all the work that you have to do, and the logistics that you have to do to be ready to take a census and for the 2020 census, we're totally changing the way we have taken the census, by introducing a lot of new automation and mobile technology. But the other area that is a challenge is to reach out to the American people and explain to them, why it's important to be counted in the census. And we do this in a number of ways. We have devoted a lot of money and funds towards paid advertising and for what we call our partnership program and that's where we hire a number of individuals that work with local communities and local governments to really get the word out as to why it's important to respond to census, how it will benefit them and also that the information we collect is very private, it's very confidential. We don't reveal our data to anyone so we protect the information that we get. Bailer : Can you tell us a little bit about some of those logistical issues and describe some of that? I mean, I'm…I imagine when the census is occurring, you're one of the biggest employers in the country at that time, aren't you, when you are doing the census? Thompson : Right, right. We're going to…this census we will probably hire between three and four hundred thousand people, that is the peak. Thompson : And that will be in 2020, primarily in May and June of 2020. So let me explain a little bit about the census. The first thing we have to do is build an accurate address list, and we do this working throughout the decade by getting information from the U.S. Postal Service, which we have a great partnership, by working with local governments to get address information from them and feature information, which are boundaries and roads, so we can update our database. The next important endeavor in the census is actually inviting people to self-respond to the census. So in the past we have done that strictly via a paper questionnaire that we mailed out. For the 2020 census we're going to offer the Internet as a primary option. But also offer both response by a paper questionnaire and also a response by telephone. And then comes the really really challenging operation for each census that has occurred going back to decades, and that is for those individuals that don't self-respond, we have to go out and collect information from every household and in the past few censuses the self-response rate has been a little over sixty percent. And so what that means is that we've had to go for almost forty percent of the households in the United States and collect a response. In the past that's been a paper and pencil operation. For this census we're going to be equipping our census workers with mobile technology that is a smartphone. We're going to be equipping their supervisors with a tablet so that we can use mobile technology to manage the workforce and introduce great efficiencies. Campbell : Oh very cool. When you get pushback from almost forty percent that doesn't respond, how are the workers sort of trained to deal with people? For instance, to say, well, the government they're just spying on us, we are not giving them any information. I mean there's got to be a certain number of people that have that sort of reaction. Thompson : Yeah. So we spend a bit of time training, we call them enumerators, on why the census is important and how to explain that to respondents, to potential respondents, to get their information. But like I said, the other thing we do is we also work with our partnership program with local communities to get trusted voices in the local areas to speak on behalf of the Census Bureau and explain to people that when somebody knocks on the door from the Census, it is a good thing to respond to them. Pennington : You're listening to Stats and Stories, where we discuss the statistics behind the stories and the stories behind the statistics. The topic today the U.S. Census. I'm Rosemary Pennington. Joining me, our panelist Miami University Statistics Department chair John Bailer and Media, Journalism and Film Department chair Richard Campbell. Our special guest is John Thompson, director of the U.S. Census Bureau. So John, the census obviously collects a wealth of data and I teach journalism here at Miami and a lot of times my students are, they play with the U.S. Census data trying to find stories. Are there stories that are in the data that you wish journalists would do a better job of, sort of, mining out? Thompson : You know, we're fortunate at the Census Bureau that we have a lot of information from a variety of different sources that we make available. What we try to do is to find ways to allow various consumers of our information to easily access the data and then turn that into stories. And so, we do things like if we're going to have a major data release we will allow the media to access it on an embargoed basis so that they can write informed stories. We have a series of tools that we've made available for specific aspects of our data. So we have something that's on our website called The City S.T.K. or city software development kit which is a tool aimed at developers so they can access our A.P.I. and get data usually that way. We have a tool that we call census business builder which links two of our data sets so that entrepreneurs and small business owners can access data that might help them make informed decisions, and we have a team of individuals across United States that we call data dissemination specialists. And they work with a variety of governments, local organizations, individuals that are interested in our data to help expose our data to them, and instruct them in how to use our data easily. Bailer : Why is it so important that we get this information? What is some of the…that the training that you do, with the people that you're sending out, to reach those forty percent and some of the stories that you tell about the importance? Thompson : The single census has a number of really really critical functions. So the first function is apportioning the House of Representatives. Another important function is that the data we collect is used in drawing fair and representative congressional districts and you know, and local legislative districts as well and so, this, this provides the basis for fair representation at local communities. We also conduct a major survey in conjunction with the census, it is called the American Community Survey and this collects a variety of information that is used to allocate over four hundred billion dollars a year in federal funding and so it's also important for communities to get their numbers right so that they are eligible to receive these funds. Campbell : Over the years you've been doing this, what are some of your, sort of, frustrations, in terms of the ways that the Census is represented in news media articles, and a second part of this question is, what could journalists do a little bit better than maybe they're doing right now? Thompson : We're pretty lucky that a lot of our data gets, you know, consumed in a good way. But sometimes there are some complex issues which do get the lines blurred. So, for example, we recently released the results of what we call our national content test, and this was a process that we used to determine, to do research, on how we would collect race and ethnicity data for the 2020 census. And this included a new category for Middle Eastern and North African people. There was a little bit of frustration here, that when these data came out, there were a lot of stories that said the Census Bureau is recommending that this be included on the 202 census and we really weren't saying that in what we were releasing. We were, we were saying that we have collected data to show that we have some new things that will produce accurate data but the next step we want to go forward with is now working with the Office of Management and Budget to go forward and determine the actual questions that will go on the twenty twenty census. We don't, at the Census Bureau unilaterally decide what goes on to the census or American Community Survey. That's a very deliberative process we go through with the Office of Management and Budget, that represents all the federal government needs that should be included there. Bailer : You mentioned some of the technology that's being used now. What are some of the other really big changes that you've seen in the census over the last two or three decades? Thompson : That's…that's a great question. So I started working at the Census Bureau at the tail end of the 1970 census, that's how back I can go! And the methodology has been essentially the same, and that is, you know, we construct an address list, we have to have geographic resources that will let us process that address list and assign it to the piece of geography, we got to mail out a self-response and we've done automated collection of the information off of the questionnaires that are mailed back. But over the years the way that's changed has been kind of dramatic. So you've seen just the growth in the Geospatial industry. And that's been a great boon to us, using you know all the new geographic tools that you can put in place, processes that we didn't have before. We've also seen real advances in the ability to process paper by doing scanning, intelligent character recognition and in this census, we will see the culmination of that. We will be using mobile technology now to collect information from those individuals that don't self-respond. There are some challenges though I should say that we've also seen. And that is, it's getting harder and harder to get high response rates to the surveys that we do and that's for a number reasons. This is that the American population is more diverse, they're more mobile, there's different ways of communication and we have to work a lot harder and offer a lot more ways to respond to keep up with that. Campbell : What doesn't the general public understand about the work of the census? What are some of the things that could be communicated to them? I mean, I know you do that in terms of just your own frustrations, with you know, trying to do a census? Thompson : That's also a good question. So I think there's there's two big parties there. One area is you know the census Bureau collects a lot of the information. We do an economic census, we do an American Community Survey, we produce income and poverty estimates, we produce thirteen major economic indicators. But I think a lot of the general public thinks that we just do the census every ten years. So that's one issue that we are constantly working with. And the other issue again is really working to convince the American people that, one, the information they provide is very important, and two, that we keep it very, very confidential. That's a big, big challenge that we are always facing, that we do not share data with anyone, that it comes in and it's held very, very secure. Thompson : Yeah, I took a little twelve year break, after the 2000 census. But again, I'm back. Pennington : Yes, yes. Over the course of your career is there a trend in sort of the demographics that you've noticed that you found surprising, in terms of the makeup of the American population or again maybe something that's under covered or you know just that something you've noticed over time that you think is really interesting? Thompson : One, just looking at the data, the American population has become you know more diverse by far. I don't think that's surprising to people that follow the numbers. The other thing that we've seen is the opportunities to really use technology in ways that we couldn't when I started. So when I started we actually really didn't even have you know I.B.M. mini computers or laptops and we certainly didn't have iPhones and iPads or tablets but the technology has just been very enabling. Bailer : What would be one of the biggest surprises people might learn about…about working in a census or about what happens in a census? Thompson : It may not be a surprise but it is just a huge logistical effort to conduct a census. And the amount of precision and planning and management that has to go into it, it is, I think, a lot more than people would think. The other thing that also I think surprises a lot of people is the cost of the census and because you have to really, like, you're not doing a survey or you're actually going every housing unit and so that that will cost a lot of money. So in 2010, the census cost a little over twelve billion dollars. And we, right now, we're introducing a lot of efficiencies for the 2020 census so we think, we will also do it, for probably around twelve and a half billion dollars. Thompson : But that's still a lot of money. Campbell : I'm going to switch gears a little bit. There's a lot of talk about fake news and alternative facts and as college professors and as teachers sort of responsible for helping our students learn about evidence, data, numbers, how to tell stories that are accurate and truthful, do you have any ideas on what we can do both as journalists and as statisticians to support informed decision making? Thompson : You know, I think the important thing that we do, and an important thing that you do, is educate people on one the value of data, and two, how to use data to make informed decisions and not…and stress that and stress that. Bailer : I'm going to ask a journalism question now. So, when you say the value of data one of the things my journalism friends will say, is that you know, there's a story here, there's sort of this this narrative. So, I know you had, you had mentioned earlier that the A.C.S. was associated with about a 400 billion dollars of federal fund allotment. What are some of the impacts of that? What are some of the ways in which that's being used? Thompson : Sure. So it's used for…for a number purposes like support block grant funding to support their transportation infrastructure and planning for that, to support where you would put schools and money for schools. The other thing though that the American Community Survey also does, it also provides a valuable resource for cities, localities and for businesses. And a couple examples of just how that can be used is, the city of New Orleans took some of the American Community Survey data on Aging and low income, to identify areas in their cities, they should prioritize a program for giving out smoke detectors to prevent you know deaths from fires, which we thought was really really an ingenious use for our data. And then in the private sector there's lots of uses of our data that actually creates opportunities and jobs. So for example, Target company uses our data to make decisions on what to put in store so that things are readily available in localities. There's a company, a geospatial company, EZRI, which uses a lot of our data to put together a product that they call business analysts. They will then use to help businesses really make informed decisions. Pennington : John, so you, you mentioned that you went basically, straight from school into working for the federal government. What advice might you have for students who would like to have a job in the federal government down the road, whether it's the Census or another Stats-focused organization? Why should they be thinking about what should they be studying? Thompson : That's really interesting. I was talking to some people at Virginia Tech last night, about that very topic. And the advice I was giving them was, it's good to understand both computational sciences, how do, you know, how to how to process data, but the other the thing that's really important is also to have a grounding in mathematics and statistics. So that you understand not only how to process the data but how to do it right and that's the kind of thing that would get you a good job I believe, not just in the federal government, but in any company that's using, that relies on quantitative methods. Campbell : So in your job, like when you went to school and studied, what you did…you are…you today, you have to deal with the public, you have to deal with the media, you know, how would you describe your training for that kind of work, and what helped you through…through that, to know that you had to, not only be able to talk to people who didn't have statistical backgrounds, but you had to communicate with, find different ways to communicate, complex material to your general audiences? Thompson : I learned a little bit of that when I was in college, but the real training I received there was when I was at the Census Bureau. They had a, they had a really good way, and they still do have a really way of bringing in young people and helping them develop throughout their careers and…and understanding that, to be fully successful and to grow and reach executive positions you have to be able to communicate with the public. One you have to be able to take complex quantitative topics and translate them into ways in which the general public can understand. And it was a lot of mentoring, a lot of, you know, investment in my development that the Census bureau just did. Bailer : So let me follow up on that. So what's…what's the hardest story to communicate about census work? Thompson : I think it varies with different audiences, because there's different interests in the census. It's so diverse so one of…one of the issues we were just, we just felt were consultations with American tribal leaders, and their focus was on how we collect information on their…on their reservations, and we had to really work with them, to communicate with them why, you know, it's important to them to respond to the census, and also how we would do the census on the reservations, and then there are other groups, which also are different and have different needs, but it's really, there's just a really diverse group of different organizations, different individuals, different stakeholders, that we have to deal with, like for example, the Congress is also a very, very important stakeholder and they're…they're really more interested in, are you spending your money appropriately? Are you on schedule to do a successful census? And you know various issues like that. Bailer : What do you like best about working at the census? 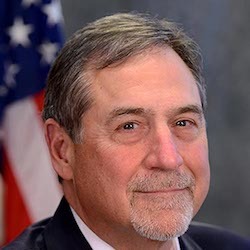 Thompson : I've been fortunate throughout my career both at the census and the NORC that I've been able to do things that actually will have a meaningful effect on the lives of the American people and will help advance its various societal goal. The work that I have been able to do has had an impact on improving the conditions of the American people. Pennington : Well, John Thompson, director of the U.S. Census Bureau, thank you so much for being here today. Thompson : You are welcome. Pennington : That's all the time we have for this episode of stats and stories. Stats and Stories is a partnership between Miami University's Departments of Statistics and Media, Journalism and Film as well as the American Statistical Association. You can follow us on Twitter or iTunes. If you'd like to share your thoughts on the program send your e-mail to stats and stories at Miami Oh-H. dot edu and be sure to listen for future editions of Stats and Stories where we discuss the statistics behind the stories and the stories behind the statistics. Paul Hunter is managing director of Customer Knowledge at dunnhumby . Customer Knowledge is understanding what customers feel, think and do to empower dunnhumby’s clients strategies. dunnhumby works with the world’s largest retailers and brands. Paul has over 25 years in leveraging data and technology to improve marketing decisions. Alex Blumberg is a radio and podcast producer who has launched the podcast 'Startup' - a "series about what happens when someone who knows nothing about business starts one." He had a long a celebrated public radio career at Planet Moneyand, while there, produced the award winning episode Giant Pool of Money about the housing crises and Wall Street reaction in the late 2000s. He joined the Stats+Stories regulars to talk about reporting financial stories and other stories with strong numeric foundations. Chris Whittaker Sofge is a toxicologist who leads a team that conducts quantitative risk assessment for hazards in the workplace. She is the Chief of the Risk Evaluation Branch in the Education and Information Division at the National Institute for Occupational Safety and Health http://www.cdc.gov/niosh/). Her group conducts quantitative risk assessment for hazards in the workplace.